When I first started fishing, I owned one five weight rod and one five weight line. It was the line that the fly shop owner suggested and told me would be perfect for the Sage Light Line I had just purchased. I almost swallowed my tongue when I realized that line I had just plunked on the counter was over $100.00. I’d like to think that the line made all the difference, but honestly I can’t remember. It was all so new, and so confusing those early days, that I have blocked it out of my memory. Fast forward 15 plus years and here I am with more lines than I could possibly use. The obsession continues, however a much more educated obsession. My walls are now covered with boxes filled with lines of all types. Boxes labeled F, I, Sink Tip, Full Sink, Type 3, Type 6, and on and on. With so many lines on the market today with such vast differences in pricing, knowing where you want your flies to sit in the water column is the most important part of choosing the right line. Probably the most common type of fly line, floating line does exactly what the name implies. The line is made to float on the water. Think of this line as the perfect line for a dry fly, a terrestrial, or a popper. These lines are also great for indicator fishing or small streamers. Fly line manufacturers impregnate the line with micro-glass bubbles of air to help keep the line on top of the water. Gone are the days of having to dry out your line and dress your line to keep it afloat. Enough said. These lines just make sense. While I could classify these lines technically under the category of sinking lines, as my favorite type of line, I think they deserve their own classification. Generally made to sink 1 to 2 inches per second, these lines are best suited when I want my streamer to move horizontally under the surface, without the “jig” type action that a streamer on a floating line would create. These lines have the added benefit of usually being clear in color, adding a stealth aspect as well. I love to use intermediate lines with an unweighted streamer pattern, as the intermediate line will pull the streamer under the surface, but keep it high enough in the water column to keep it from getting stuck on the bottom in shallow water. While it seems crazy, fishing with large poppers and divers with an intermediate line can prove deadly because the little bit of sink from the line will provide a thicker bubble trail behind the popper and get the fish’s attention. Again, as the name implies, sinking lines sink. Sinking lines are made by incorporating tungsten dust into the fly line. The amount of dust added determines the sink rate. Those sink rates are called “types.” Generally speaking, a Type 3 line will sink at 3 inches per second, whereas a Type 6 line will sink at 6 inches per second. The faster the sink rate, the deeper you can effectively fish a fly. Note that the sink rate is independent of the grain weight of the line. If you have a 7 weight rod, you need to choose a 7 weight sinking line of the sink type you desire. Be aware that sinking lines are not uniform in density, meaning that you can purchase a line where the entire length sinks or a line with as little as a five foot sinking section. The longer the sinking section, the deeper the fly will go. The choice between using a Type 3 or 6 line is not solely based on how deep you want to fish. Type 6 lines are helpful when throwing a big, bulky fly, as the increased density in a Type 6 line will pull a larger fly down. When using a sinking line, be aware that the chances of losing flies on structures you can’t see are increased. Although floating flies make up a lot of fishing situations, there will be times when the best way to catch fish will be to get the fly down to where the fish are. Knowing the difference between floating, intermediate, and sinking lines will make a huge difference between fishing and catching. Fly rods are categorized in line weights. When purchasing a new fly line for your 6 weight rod, choose a 6 weight line. Gone are the days of over-lining your rods. 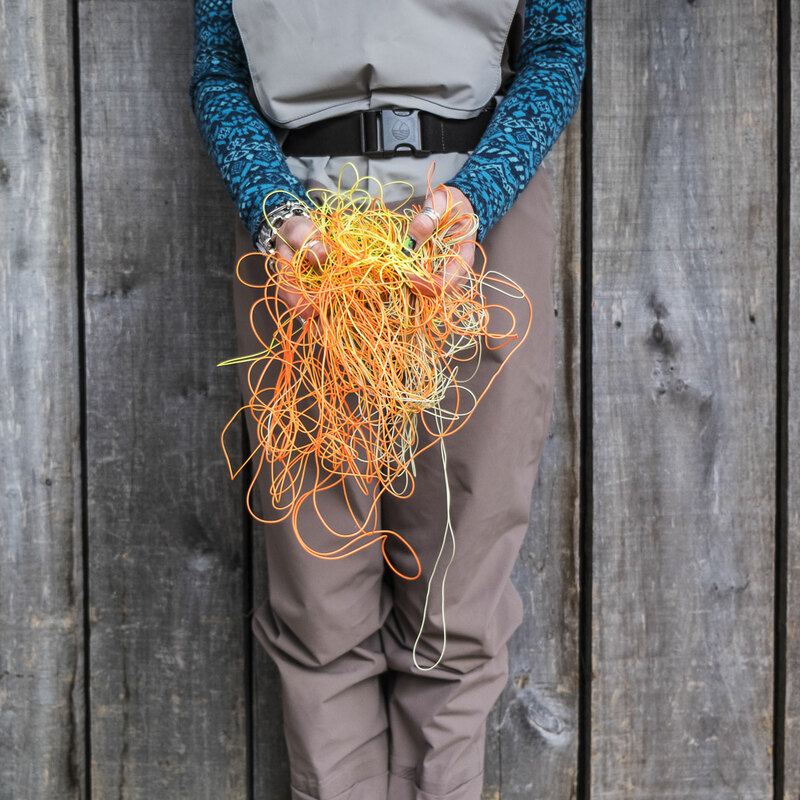 Today, fly line manufacturers build lines that make it easier to load a modern fly rod.